Damn Yak Dry Goods Co.: Hides In Hand Tour. Located in Rockwood, Ontario. 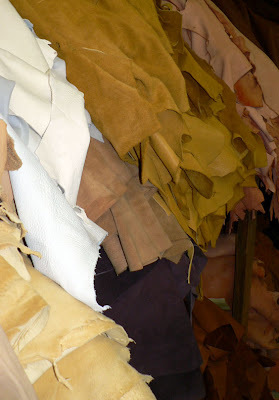 Hides In Hand have been making superior leather goods for over 15 years. The company was originally started as Marzo Glove back in the 50’s, specializing in industrial gloves and such. As the need for cheaper work gloves was needed, the majority of manufacturing moved off shore to China and Pakistan, decisions were made and people were brought on board to help save this long time company. 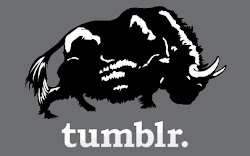 They changed focus and decided to make products that would not be interesting, or relevant if they were made overseas. Which brings us to Hides In Hand. For the past 16 years they have been making a huge array of products, ranging from purses, hats, slippers, traditional moccasins, mukluks, gauntlet mitts, driving gloves, as well as still manufacturing superior work gloves. 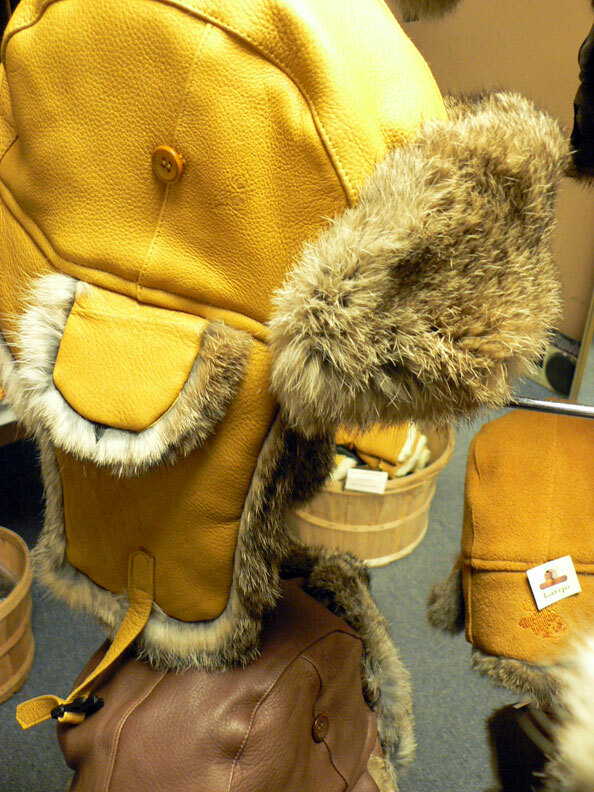 All made using Moose, Deer, and Bison leather from local hunters that are tanned in a local tannery also in Rockwood. I recently had to stop by to get a slipper repaired, and had the chance to meet up with Hides In Hands creative designer Teresa Paul, and take a quick tour of their fine manufacturing facility. As we leave the showroom, we make our way down the “stockroom”, a dimly lit, cold hallway with the wonderful overwhelming smell of leather. Lined with stacks of finely made everything leather, it was quite a site for the eyes and this was just the beginning. I was guided through the next door, we found ourselves in the main room. 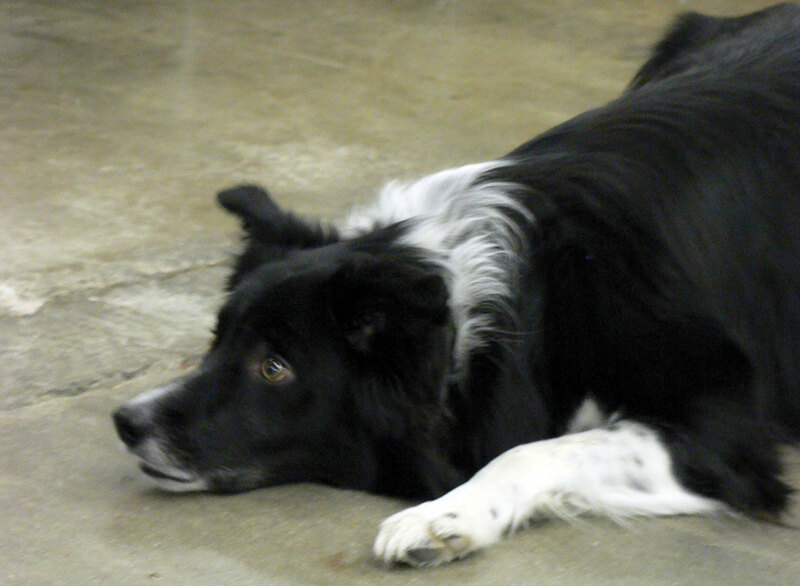 Greeted with smiles from the staff, and the curious nose of Moya, “Hides in hands” mascot pup! 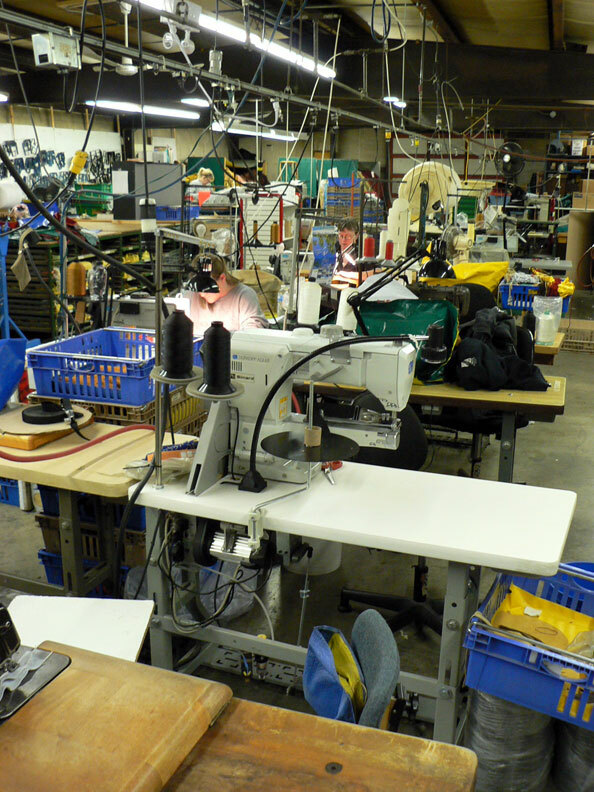 The room is filled with a beautifully long cutting table, plenty of sewing machines, a bunch of press cutters and other specific use machines. 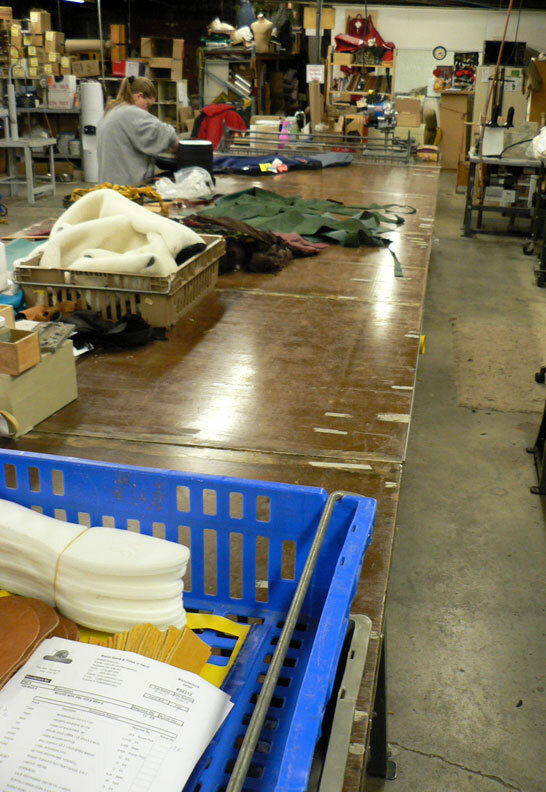 I was guided to the back of the room, and shown the massive stacks of leather and cutting dies. Piles taller than me, all sorted meticulously by species and colour filled the area in which the cutters work. A wall about 20 feet long is filled with the cutting dies from top to bottom like wallpaper. Organized by pattern and size. Teresa explained that everything they get is as local as they can find. Nothing they use is from overseas; the furthest they have had to go for some of the deerskins is the US, but again its bought from the areas local hunters. You can tell in how everything was explained, in every attention to detail that is told to me, that this is one group who is proud of their goods from start to finish. 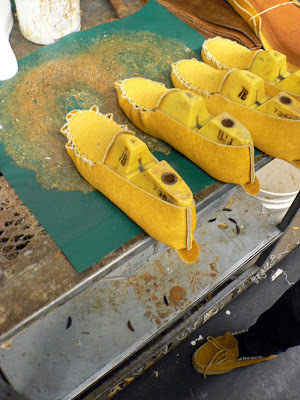 As we make our way over to the sewing machines, to see soles being attached to the bottom of the moccasins. The Woman using the machine works it like it is truly an extension of her arms. She zips through the leather like butter and on to the next moccasin, in one fluid motion. From there we moved to the area where the soles are first cemented to the moccasin, before sewn to the bottoms. All hand laid while on vamps to make sure alignment was perfect, from there they are put in the “hot box” to cure, a homemade wooden box filled with lamps to heat the moc before sewing. 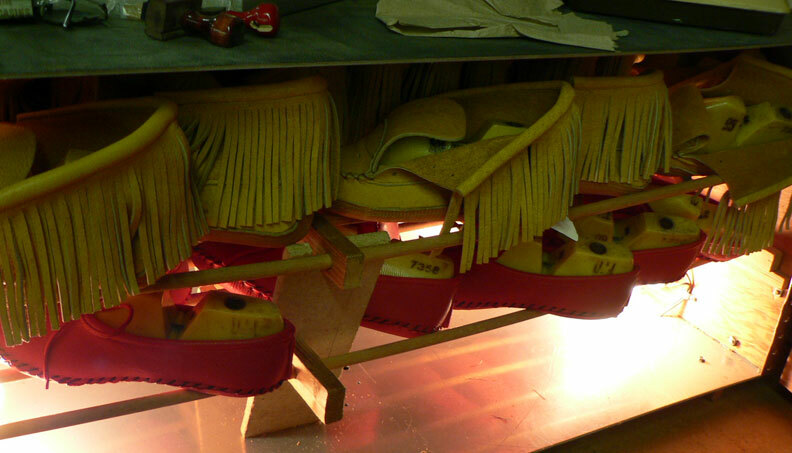 They also use the “hot box” for form the completed moccasins on vamps to give them some shape. As we finished up the walkabout, we check out the glove heaters that form the gloves and give them their final shape and make them look pretty. The heaters look like polished metal gloves themselves that are as long as a whole forearm. Also Check Matchstick Lake's Post on Hides In Hand. Good to know man! You have had multiple pairs? Do you treat them with anything? Yeah last time I was there I grabbed another pair only because they were in the seconds bin for 25 bucks and nothing was wrong with them. I think I may have put some boot dressing on my original tanned pair a while back but haven't touched em in some time. Nice! I can't wait to get some snow or cold weather for that matter to give them a whirl! They're super comfortable! It was cool of them to have you, but I was looking at their leather and it definitely doesn't look natural or locally tanned. It looks like chemical tan stuff, which is actually usually done in China....even if the deer itself came from Canada. The big give-away is the bright yellow colour that only the chemicals can make! @anon - are you making this deduction solely based on my pictures of the deerskin under bright lights? or are you basing this on actually seeing the leather? If you google maps White Tanning in Rockwood you will see that they are just down the street from Hides In Hand. That seems bizarre that a 16 person operation would ship thousands of hides to China to ship them back here, when a tannery is 10min away? Just a thought, Thanks for reading! The Romance of the Far Fur Country - HBC Film. Klein Tools / Rite In The Rain Giveaway! Damn Yak Dry Goods Co. Tablet Stand.